New Projects with a 20% commission rebate! Make sure to visit the New Project with an OahuRE agent the first time you go. This will assure that you get your 20% commission rebate and we will be there throughout your purchase to answer any questions that come up. If you sign up yourself without OahuRE then you will not be eligible for the 20% commission rebate. The rebate gives you $600 per each $100,000 purchase price, so for a $700,000 purchase you would get a $4,200 rebate. 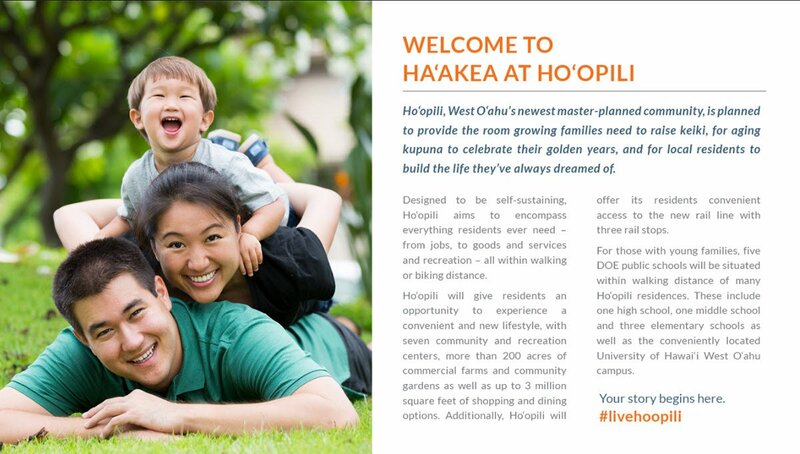 Have you been dying to get a lot in the Ho'opili community? Through hard work and research from our agents, we were able to get our client a home in their dream community. Not only that, they received 20% of our commission rebated back to them at closing. If you are struggling to find a strategy on how to get a lot of your own and need an experienced agent that will work hard to make sure it happens. 400 Keawe - If you have been to Kakaako lately, you know something exciting is happening. You can see it in the district’s dynamic outdoor murals, created by local and international artists. You can feel the energy from young entrepreneurs working in collaborative spaces within Kakaako. You can hear it in the music and laughter floating out from Eat the Street, the Night Market and other unique cultural events. You can taste it in Kakaako’s chef-led eateries, and bring it home from galleries and shops that showcase creations found nowhere else on the island. And very soon, you will be able to call this magnificent place your home at 400 Keawe – the epicenter of Kakaako’s nine-block re-imagination. A different and comfortable 6-story condominium experience by Castle & Cooke Homes Hawaii, 400 Keawe shares a deeply personal vision of what life in the 808 should be: Dynamic. Welcoming. Authentic. And yours. 400 Keawe: Don’t just sleep here. Live here. 803 Waimanu Street - The project by Mola’s MJF Development Corp. consists of a 65-foot seven-story building with 153 market-priced residential units and includes a mix of studios, one- and two-bedroom units. The development also will have a mechanized ground-floor parking system with 92 parking stalls. Aloha Kai Redevelopment Project - Contemporary urban-living visionaries believe that the best development is redevelopment. Look to the future but don’t forget the past. The Aloha Kai/Central YMCA redevelopment project embraces this concept. Unable to afford upkeep on the aging YMCA building and because renovating the existing building was impractical, the YMCA of Honolulu Metropolitan Board of Directors decided to partner with Aloha Kai Development to redevelop the Y’s nearly two-acre property. After looking at several different proposals, the YMCA board decided that Aloha Kai’s redevelopment plan best reflected the YMCA’s goals. Under the agreement, Aloha Kai Development will build a new YMCA at its current site. The YMCA is selling a portion of the roughly two-acre parcel it owns to Aloha Kai to create a 128-unit, 39-story residential condominium tower and parking. The redevelopment will include upgrades along Atkinson Drive to improve and better manage traffic flow. Now that the Honolulu City Council has approved Aloha Kai’s zone-change and the redevelopment project is moving forward, Aloha Kai would like to thank the Central YMCA and the YMCA of Honolulu for becoming a partner in this unique project that will bring new housing options to an important part of Honolulu, create a new Central YMCA and will spur further needed improvements in the Hawaii Convention Center area. Anaha - One of the most sophisticated and design-forward towers on Oahu, Anaha plans to set a new tone for the evolving architecture of Honolulu. Located in Honolulu’s most distinguished urban neighborhood and designed by Chicago-based Solomon Cordwell Buenz in partnership with Benjamin Woo Architects, this planned 311-unit building offers a diverse range of sophisticated residences. Beyond the services and amenities of the building, residents of Anaha also have access to all of Ward Village, a master-planned community that offers a wealth of shops, restaurants, entertainment options, and artfully designed public spaces. 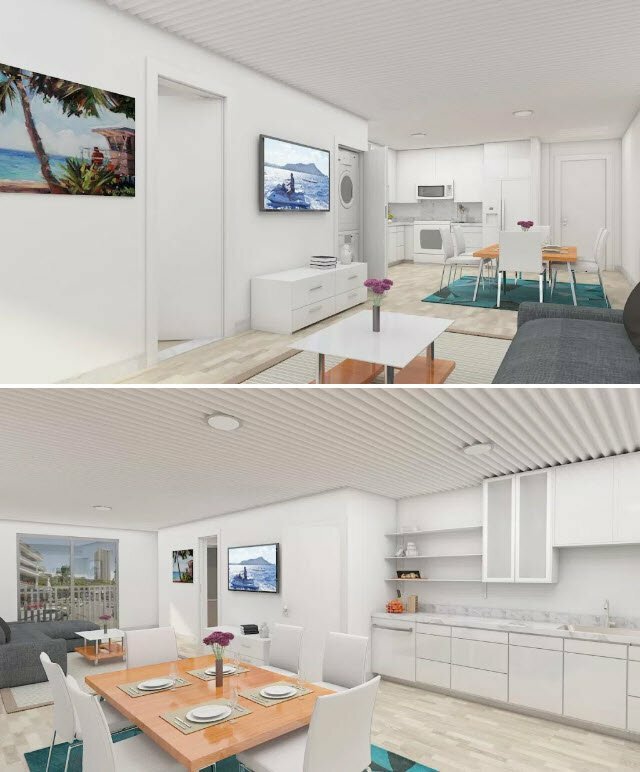 Commodore Waikiki - Fee-Simple One Bedroom, Two Bedroom and Penthouse Condominium Residences Imagine your own personal oasis amidst a secluded residential neighborhood, just steps from the Ala Wai Promenade, Ala Moana Center and the Hawaii Convention Center. This is a reality with the Commodore Waikiki. This charming four-story boutique condominium building offers just 43 units – many of which have been upgraded – ranging from $280,500 to $549,000 FS. See it today and experience it for yourself! Hokupa'a Homes - We are Pleased to Announce Hokupa'a Homes, Hawaii Kai's First New Development in a Decade Located in Kalama Valley, Hokupa'a Homes will feature 14 single family homes, each with four bedrooms and three bathrooms in a two story residence. Along the 7th and 8th holes of the Hawaii Kai Golf Course, these homes will offer golf course and Koko Head views. Pricing is anticipated to start at $1,500,000. Contact us for more details. Hoakalei Residences - Welcome to Hoakalei. Where you're surrounded by the emerald green fairways and sparkling waterways of the Hoakalei Country Club Golf Course, the only Ernie Els signature course in Hawaii. Where the spectacular new Wai Kai Lagoon is now taking shape - and will one day invite you to come out and play in friendly, sheltered waters. And where new neighborhoods are opening, unveiling a fresh selection of island-inspired home designs. Crafted with the same exceptional quality that has become the hallmark of Haseko. Come have a look around. Tour the model homes. And discover the many reasons why Hoakalei is called Hawaii's year-round, family-friendly resort. Ka Makana - A beautiful beginning. As the first neighborhood to open in Hoakalei, Ka Makana has set the standard for the resort’s year-round, family-friendly lifestyle. Surrounded by beautiful golf course views, featuring emerald green fairways and sparkling waterways, Ka Makana never lets you forget that you’re living in one of Hawaii’s premier resort communities. 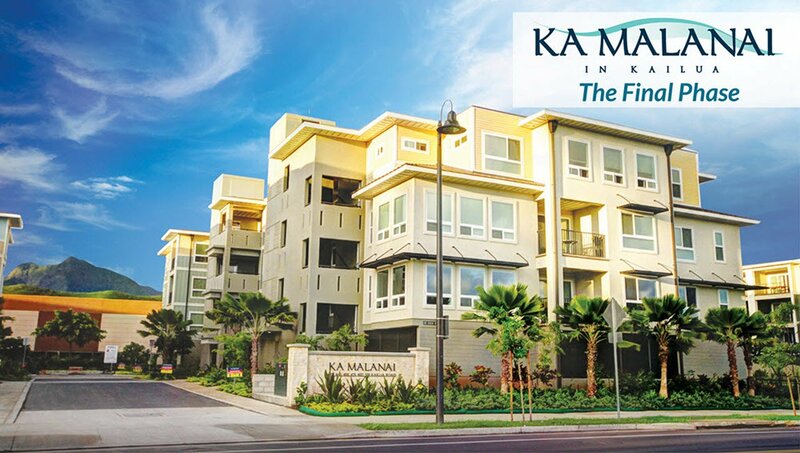 Ka Malanai - Ka Malanai is Kailua’s newest development and consists of six attractive four story condominium buildings. Homes each include air-conditioning, designer kitchens with stainless steel appliances and top quality finishes. Building amenities include access-controlled elevators to residential levels in all buildings, ground floor reserved parking, multiple courtyards/barbecue areas and shared outdoor storage for residents. Kapiolani Residence - Kapiolani Residence, at 1631 Kapiolani Blvd, will be a new 45-story, 485 unit condominium. 292 units will be offered as Affordable Housing units under the Hawaii Housing Finance and Development Corporation ("HHFDC") guidelines to owner-occupants who meet HHFDC eligibility and income requirements. Anticipated pricing for affordable units will range from $272,000 to $592,000 and include studios, 1-bedroom, 2-bedroom, and 3-bedroom floorplans. Contact OahuRE.com for more information. Kapiwai Urban Sanctuary Honolulu - A private, green community that accessed by a new private roadway. Homesites average over 11,000 sf each nestled above the 7-acre Gardens on Pauoa Stream. Only minutes from the very heart of downtown, Kapiwai will consist of twenty-four large homesites with new 3 and 4-bedroom eco-luxury residences that have been architect-designed for maximum privacy and minimum impact. Nearly every homesite opens onto the Gardens, offering expansive views and access to the spring-fed stream, waterfall grotto, hiking paths, and the stonework and waterways of ancient lo‘i and ‘auwai. 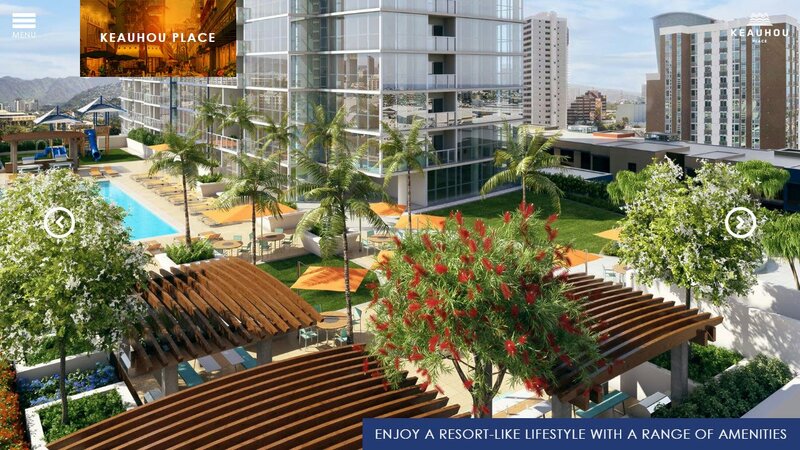 Keauhou Place - LOCATED IN THE HEART OF KAKA’AKO, KEAUHOU PLACE INTRODUCES A NEW CONCEPT & DESIGN TO URBAN LIVING. Keauhou Place redefines what it means to live in Honolulu. Featuring 1 - 3 bedroom condominiums and townhomes in the vibrant Kakaako urban village, these homes are just steps from the beach and are surrounded by restaurants and shops. Ke Kilohana - Ke Kilohana at 988 Halekauwila is a new 43-story, 424-unit condominium high-rise coming soon to Ward Village. With 49 market residences and 375 residences reserved for qualified Hawai'i residents, Ke Kilohana invites you to become part of Ward Village's vibrant neighborhood. Kipuka - A tranquil oasis. There’s just something about driving through that gated entry that makes you feel as if you’re entering a separate little world. And a very charming separate little world at that. The homes have a relaxed, beachy vibe enriched by artful, island-inspired detailing. The Golf Series homes are positioned around the outer edge of the neighborhood, almost all overlooking the beautiful Hoakalei Country Club Golf Course. While most of the homes in the Garden Series are positioned away from the street, facing landscaped interior greenways. So there’s always something beautiful to look at when you step outside. Koa Ridge - Future Communities - Koa Ridge Nestled on the slopes of Central O‘ahu, Koa Ridge is Castle & Cooke’s newest master-planned community. Following on the heels of our award-winning Mililani community, the pedestrian- and bike-friendly Koa Ridge embraces the principles of Smart Growth and Sustainability to create a community that provides the highest quality of life for our residents. Boasting 3,500 homes, a walkable mixed-use Village Center, recreational amenities and an elementary school, Koa Ridge will be a “live, work, learn and play” community. Pedestrian and bicycle paths will connect homes to shopping, dining, parks, recreational amenities, healthcare services and a central elementary school. Kuapapa - Like the touch of an offshore breeze. That’s how refreshing life is in Kuapapa, the newest neighborhood of Hoakalei. A place where the charming seaside-style cottages of our newest collections, the Loulu and Naio Series, join with island-inspired homes of the Koa Series. And where the newly opened Wai Kai Hale Club will call to you and beckon you to play in the spectacular, sheltered waters of the Wai Kai Lagoon. Live, Work, Play, Aiea - A thoughtful mixed-use sustainable community where a neighborhood market, restaurants, retail shops and a walk-to-work office community are combined with residential living and public gathering areas creating an “Urban Village” where people will live, work and play. Park Lane - situated in the best location in all of Honolulu. With world-class beaches, luxury shopping, premier dining and entertainment minutes away, Park Lane presents the opportunity to experience the beauty of nature and cosmopolitan city life at its finest — and most vibrant. Of course, just outside Honolulu lies the entire Island of Oahu, resplendent with beauty just waiting to be explored. Parkside - ParkSide by Gentry is a community surrounded by green spaces. On the Westside, Coral Creek golf course, to the North, Geiger Park offers tennis, basketball, soccer, and a baseball diamond. East and just across the street, a new Ewa by Gentry community park will offer additional activities in the years to come. And our southern neighbor is the new Ewa Makai Intermediate school. Within the community of ParkSide, small parks will offer homeowners places to meet and play with kids or pets. Gentry's Living Green building program and ParkSide's unique location will offer homeowners a new way to live Hawaii. We hope you enjoy visiting ParkSide by Gentry and should you decide to make this place your home, Mahalo and welcome to the Gentry family. Ritz Carlton - The Residences Waikiki - Luxury on Waikiki Beach The Residences is located adjacent to Luxury Row at the entrance to Waikiki Beach. This neighborhood’s location is defined by Fort DeRussy Park and its beach, Kalakaua Avenue and its shops, and a good portion of downtown Waikiki. The shopping, dining, relaxing and rejuvenating found here place it among the most valuable and coveted real estate in the world. Exceptional Dining, Amenities and Shopping Fully Furnished, Professionally Managed Residences. Legendary Service & Privileges of Ownership The Ritz-Carlton provides residents and their guests with the finest personal service. Absolutely nothing else compares to the Ladies and Gentlemen of The Ritz-Carlton who help to bring this philosophy to life. Both artists of anticipation and ambassadors of the brand, their credo is to deliver personal and memorable services and experiences to owners and their guests. STUDIO, 1, 2 & 3 BEDROOM OCEAN VIEW RESIDENCES ARE NOW AVAILABLE FROM $898,800 - $6 MILLION. Sixty Parkside - Sixty Parkside is a gated community in the Mililani area of 48 townhouses, all three bedroom/two bath. Units feature an open floor plan with Travertine stone flooring, custom carpeting, vaulted ceiling in upper units, and courtyards in ground floor units. The kitchen is equipped with stainless steel appliances including a refrigerator, oven, cook top, microwave/range hood, dishwasher, and granite countertops with custom edge finish. Symphony Honolulu - Symphony Honolulu is the new residential condominium rising from the heart of Honolulu’s Kapiolani corridor. It’s a masterwork of contemporary design amidst Kaka‘ako’s abundant, growing culture of art, theatre, concerts, shopping, dining, and nightlife. A residential haven of panoramic views and finely orchestrated amenities, where every element comes together in perfect harmony. Bring your passion for sophisticated living to Symphony Honolulu. Symphony Honolulu captures the city’s artistic nature, cosmopolitan energy and warm aloha spirit. It’s a thrilling addition to the Kaka‘ako neighborhood, an up and coming community that has it all – from shopping and movies at Ward Center to premier concerts and exhibitions at Neal Blaisdell Center just across the street. The Collection at 600 Ala Moana - Three distinct residences. One amazing community. Much like an art exhibit, The Collection is made up of distinct pieces in a single setting. 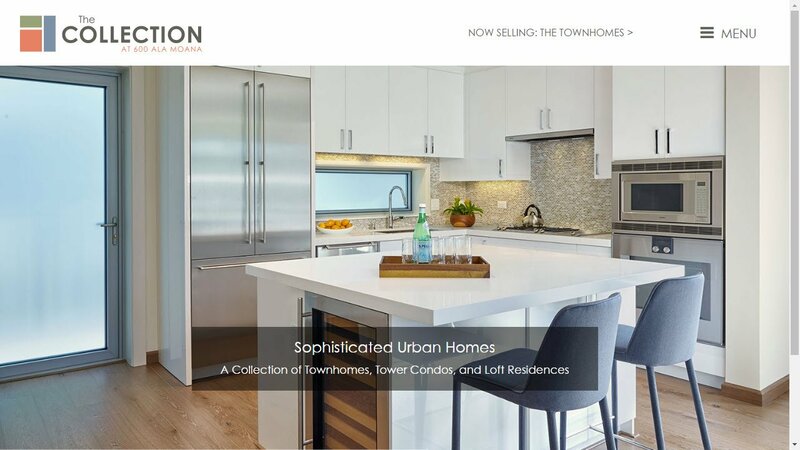 The 43-story tower, four-story mid-rise and one-of-a-kind urban townhomes combine to create an innovative new community, with some great traditional amenities and a few new and unique ones. Vida - 888 Ala Moana - Convenient location within walking distance of shopping, dining, and recreation. Feng shui inspired design. Local art throughout, including commissioned entry sculpture by renowned artist Satoru Abe. Private elevator which enters directly into your own entry foyer. Panoramic ocean views from every residence. Building design maximizes light and provides natural ventilation. Double-paned, low-e glass window system. Large exterior lanais for each residence. Generous amenities and a spacious recreation deck. Landscaping features designed for Hawaii’s environment. 24-hour electronic security in parking garage, common areas, and elevators. Same-level parking access to elevators. Trash chutes on every residential floor. Level six annex and storage units. Pet-friendly building. On-site residential management services provided by specially trained Residential Specialists™. Waiea - An entirely new level of luxury in Hawai‘i, the planned Waiea represents the pinnacle of high-end living on Ala Moana Boulevard. With its sweeping, unparalleled glass facade and spacious view-oriented interiors, this 36-floor tower represents a level of architectural sophistication never before available in Hawai‘i. The flagship building of Honolulu’s most distinguished urban neighborhood, Ward Village, and designed by award-winning Vancouver-based architect James K. M. Cheng in collaboration with Rob Iopa and WCIT Architecture, Waiea will be Honolulu’s most luxurious address. Ward Village - A coastal community in the heart of Honolulu, Ward Village is being thoughtfully curated by community developer The Howard Hughes Corporation. Exceptional residences, an eclectic collection of retail stores and entertainment venues, pedestrian walkways, outdoor gathering spaces and a 60-acre coastal address. Ward Village is Honolulu’s newest contemporary village: a cosmopolitan setting, a fresh, modern attitude that embraces Hawaiian culture, the perfect mix of urban and island living. The transformation begins now.